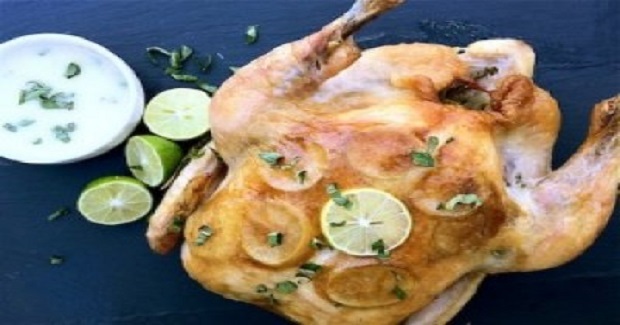 Key Lime + Garlic Roasted Chicken Recipe - Gutom Na! Posted on Friday, December 16th, 2016 at 2:56 pm. Preheat oven to 450 degrees. Unwrap chicken, rinse off, place into a roasting pan and set aside. Slice two of the key limes into round discs about a 1/4inch thick and set aside. In a small bowl, add the juice of one of the remaining key limes, garlic, olive oil, brown sugar and chopped thyme sprig and mix together. Gently lift the outer skin of your chicken and pour about half of your olive oil mixture into the area. Gently massage this into the flesh of the chicken. Next place slices of key lime under the skin and close the skin back up by pulling it gently back down. Drizzle the remaning olive oil mix over the top of the chicken and rub into the skin. Sprinkle the whole outer chicken with salt. Insert the juiced key lime into the cavity of the chicken along with the remaining spring of thyme. Add one cup of water to the pan. Place into the oven uncovered and cook for 25 minutes. After 25 minutes reduce heat to 350 degrees and cook for about 18-20 minutes per pound or until clear juices flow out of the chicken. So for example the 14 pound chicken will need to continue to roast for about 2 1/2-3 hours. When chicken is finished remove from the oven and let it settle for 10-15 minutes before carving. To make a quick and easy gravy – simply remove the remaining juice from the roasting pan and place it into a saute pan. Add the juice of the remaining key lime, fresh basil and black pepper. Gently whisk together over medium heat. Slowly add flour one tsp at a time until it begins to thicken while you continue to whisk. Once the right consistency, remove from heat and serve over sliced chicken.